I’ve lost motivation. I’ve been home for almost three months and I’ve found myself slipping into a lazy lifestyle. I don’t write. I find it troubling to type these few sentences. I don’t know if it’s the comfort of being home, the easiness of this life, or the start of winter that’s makes it harder to get out of bed and even harder to put words down. I have so many stories to share and I fear I’ll lose the memories as time continues. I’m glad to be home. It’s truly a blessing to reunite with the amazing friends and family I have, but everyday I dream of having my backpack on and traversing somewhere in South America. I’m happy for my friends. For those who are having success in their jobs, buying homes, and starting families. As much as I care for these people and love them so much, I know in my heart I need to go back. I need to get out there and see it all. I fantasize about Antarctica. I see myself climbing Machu Picchu and bungee jumping in New Zealand. I want to visit all the wonderful travelers I met on my way and meet more. My friend Jon pointed out the fact we’re getting old. The people around us are moving forward, fast. And it’s absolutely wonderful if that’s what you desire but to me it seems like getting stuck in the same life forever. I apologize, I don’t mean to offend anyone or judge your lives. 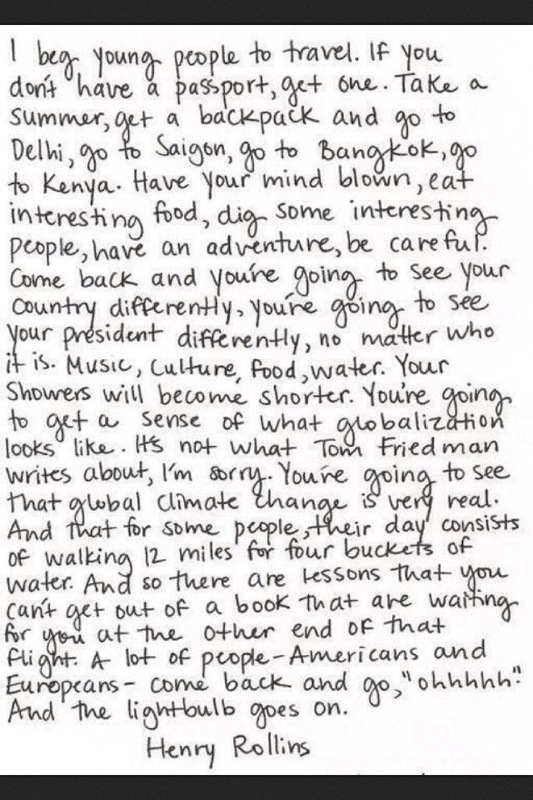 But for me, I can’t stand the thought of not experiencing all the world has to offer. I’ll be gone again. Floating around the amazing countries south of us and then off to somewhere else. I want to drift slowly and see as much as possible. I don’t know where my life will go and I love it. I’m not trying to tell you to live my lifestyle. I’m not writing this to offend your current situation nor make you jealous. I’m just being honest on how I view life. How stepping outside the American bubble just for a bit is eye-opening. I hope to inspire. To push people to get out of their comfort zone and fulfill a dream. It might be different then mine but do it. Find a way. I titled this Taiwan thinking I would share some stories from that crazy week but instead I went off on another travel rant. By the time I’m off again you’ll be sick of me telling stories anyway. Ha. Love you all. And hey, smile. Life is simple, stay happy. You have no idea how much this actually touched me. I’m writing a blog myself about my travels but most of the time I just want to get the hell back out there! Teary eyed here. Thank you so much for writing this inspirational piece! Aw thanks for the wonderful words Karina! I completely understand how you feel! Good luck with the writing and get back out there as soon as you can! Cheers!